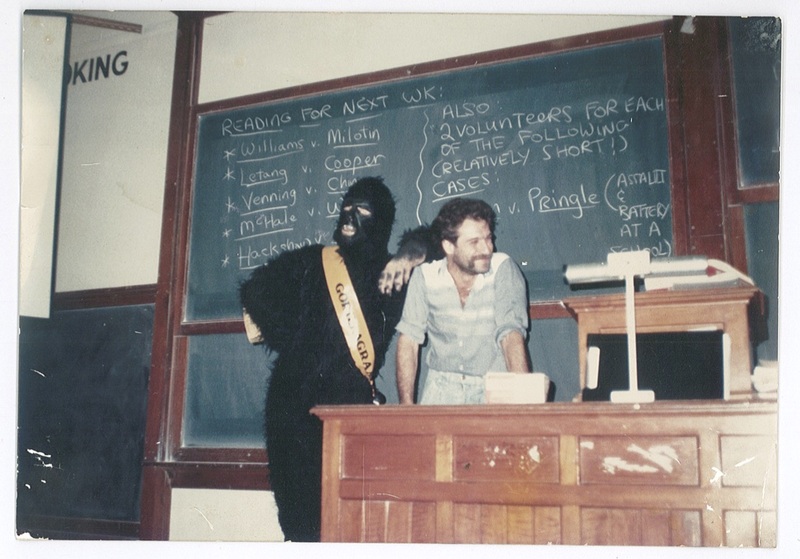 A ‘Gorillagram’ sent to Professor Ian Malkin in March 1987 for his 30th birthday. Colleagues arranged it as a surprise in the Old Arts building, with about 125 students and staff gathered at the back as he appeared and read a poem. At the age of 29, while still living in Winnipeg, Canada, and with three degrees and a few years of criminal defence work under his belt, Professor Malkin decided he would try his hand at teaching. In 1986, he got a call from Professor Harold Luntz (MLS Dean 1986-1988), inviting him to Melbourne with a three-year lectureship contract. “I’d already rejected an offer from a Tasmanian university because it felt like the end of the earth. I’m not sure why, but, very oddly, Melbourne felt a lot closer,” he says. But when Professor Malkin got on the plane to leave his home country of Canada, he worried he was not cut out to be a teacher. As it turns out, Professor Luntz’s faith in his new hire was well placed. Professor Malkin is now one of the University of Melbourne’s most decorated teaching staff, having garnered numerous teaching awards. Nevertheless, the fear of stepping into the classroom for the first time is an experience Professor Malkin still remembers and will never forget. “I was way over-prepared to compensate for what I felt was a notable lack of teaching skills. My overhead projector slides had so much writing on them, and I’d used so many colours, they were unreadable,” he recalls. Realising that he was not alone in feeling this way, Professor Malkin has since worked tirelessly with a wonderful community of colleagues to develop formal support for teaching development. He is now a lead figure in spearheading the valuing of teaching at MLS and the University of Melbourne. He describes how in 1989, as a novice teacher, he participated at the Australasian Law Teachers Association’s Residential Teaching Workshop. A few years later, he was co-running the workshop. Part of Professor Malkin’s success derives from his constant efforts to challenge cultural conceptions of the value of teaching. One of the Law School’s longest serving teachers, he is legendary for his ability to inspire and engage students, and for sharing his passion for teaching with colleagues. Professor Malkin’s contributions transcend the classroom: five years ago, he established the Ian Malkin Scholarship to support an LLB or JD student to take up an internship in the not-for-profit or government sector. Reflecting back on his 30 years at MLS, he says the best part about being around for 30 years is getting to see past students become brilliant new colleagues and fantastic friends.